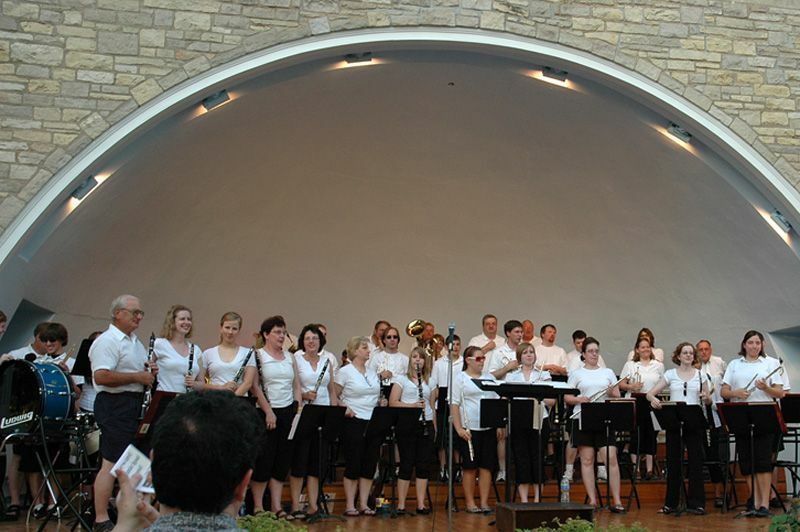 To reserve the Bandshell for special events such as weddings, concerts, etc. call the Parks & Recreation department at 402-643-3511. Seward’s Historic Bandshell was built in 1930 and seats approximately 150-200 people. It is the focal point of the Seward 4th of July Celebration with many events taking place on the stage. events such as presidential campaigns, weddings, county fairs and places outside the county. In the early 1900s the Seward Musical Association was organized and became one of the leading bands in the state. By the 1910s the Seward Municipal Band was officially formed. On August 11, 1934 the Seward Municipal Band played their first concert in their newly constructed home, the “Rosebowl”, also known as the Seward Bandshell. The land on which the bandshell sits was given to the City of Seward by Mr. J.C. Thomas, so that a community band would always have a place to perform. 129 years later the band is one of last remaining and longest running community bands in the state to hold weekly concerts. The band is made up of a diverse group of individuals. The ages range from 8th grade to those who have played for 30 years or more. They have musicians from several surrounding counties that come in every week to play. Members are teachers, university professors, farmers, students, designers, doctors and many other professions, plus three outstanding directors with a wealth of musical talent and directing skills that lend to the great sound. Each year they come together for 12 weeks to provide family entertainment for the community as well as a look back into history. Just as the bands origins come from a family band, members today are like a family making bonds and friendships that last a lifetime, all from sharing their love of music.